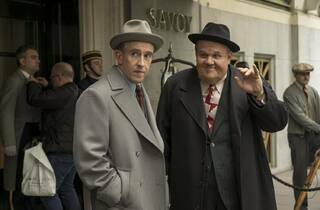 Starring John C. Reilly and an inspired Steve Coogan, this biopic about the classic comedy double-act Laurel and Hardy is a sweet end-of-year dessert. Not since Martin Scorsese followed up the mob mayhem of Casino with two hours of Buddhist asceticism in Kundun has a director made such a pronounced movie-to-movie gear shift as Jon S. Baird does with his gentle follow-up to his 2013 Irvine Welsh adaptation, Filth. 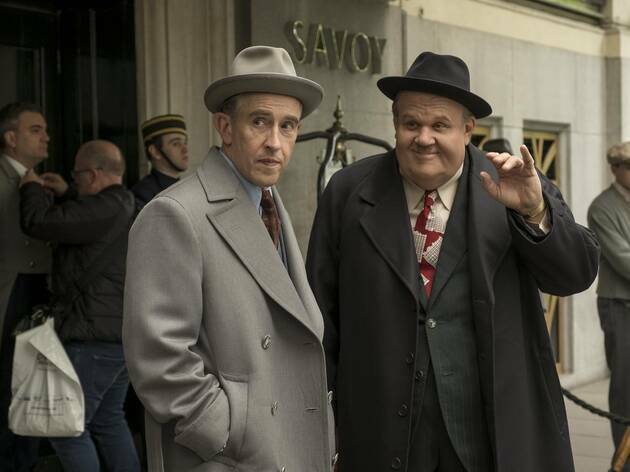 Cocaine squalor gives way to Stan & Ollie, a wistful, heartfelt celebration of the friendship between comedy giants Stan Laurel (Steve Coogan) and Oliver Hardy (John C. Reilly), which contains plenty of cozy movie-biz nostalgia and some mishaps with hats. It’s a love song played in a minor key, and it leaves an unexpectedly lingering impression. It’s also suitable for grandmas, if you need an option. Scripted by Philomena’s Jeff Pope (working closely from a book by Laurel and Hardy historian A.J. Marriot), the story charts the duo’s final years as they embark on a grueling tour of British theaters while trying to get a new Robin Hood picture off the ground. It’s 1953, and the world has long since moved on from their brand of slapstick to new talents like Abbot and Costello. The crowds are thin and their prospects look thinner. Imagine This Is Spinal Tap with extra pratfalls. The two leads are terrific: Reilly defies a slightly iffy fat suit to give us an avuncular but creaky Hardy, bemused by his friend’s work ethic and obsessed with the finer things in life. Coogan, in particular, is a revelation as Laurel, dialing down the trademark head-scratching mannerisms and unpeeling layers of disappointment and melancholy as the funnyman grapples with their failing film project and past wounds. Both disappear entirely into their characters, nailing the pair’s comic routines in a way that quietly speaks to a thousand hours of practice. Stan & Ollie sprinkles in some of the pair’s classic lines (“I’m never getting married again,” says Laurel. “I’m just going to find a woman I don’t like and buy her a house”), but it laudably doesn’t get bogged down in too much that’s familiar to a niche audience. There are also juicy supporting roles for Shirley Henderson and Midnight in Paris’s Nina Arianda as the comedians’ long-suffering wives, Lucille and Ida. The film may be called Stan & Ollie, but it’s never more alive than when the four of them are onscreen. I know very little about the famous duo so it was a whole new story. With excellent acting the film provided a heart warming story which I would highly recommend.